Sentence strips- “Carlos” messed up our story and now we have to put it in order again with a partner- (drops the sentence strips “accidentally”) Change a detail and then in review you ask about the change. Comprehension Checks- Example: Teacher says “¿Cómo se dice ‘tiene’ en ingles? 1,2,3” Students say – he or she has (with gesture) The counting allows for think time for students. Rock Paper Scissors- if you lose then you go behind the winner and create a “conga line” as the winner finds someone else. If they win again the other person’s “chain” joins them until there are only 2 lines. Winner of that wins or pays the teacher. 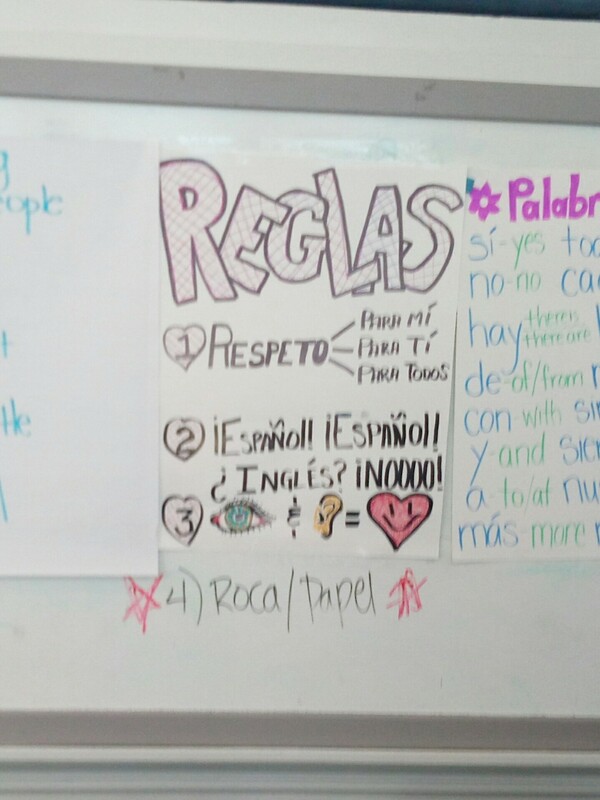 Project structure with translation on screen for whole class, student draws on her iPad and class tries to guess (“QUIERE-WANTS” students draws a dog.) Then PQA around the picture. Erase the picture on iPad and have another student draw something else using the same structure. Dictionary page with the structure and English translation. Then at the bottom students add a picture and out-of-bounds vocabulary from the board. They can only add 3/4 of the words from the board. Practice OUTPUT (Not to introduce vocabulary) – Yo quiero ______ . Practice saying. Each student gets a card with an animal. Practice again. Ball up and snowball fight when you hear music. Pick one up and find a partner. Say the phrase (Yo quiero ______), high-five then wait for music to snowball fight again. Rinse and Repeat. Teacher says Spanish sentence from the story. Students write if it is true or false. VERY SIMPLE SENTENCES – corre rápidamente, llevan/tienen ropa rojo, ¡Qué chistoso! ¿Al toro le gusta rojo? Stopped and paused for the first 3 minutes then just let the video run. **Check out Annabelle’s blog- She is planning to post her resources from this week on her blog. If you see any typos, feel free to email me. Typed up quickly.